Could you hear a difference in a single piano tone depending on the way its key is depressed? Are accomplished musicians able to discern sounds produced by a virtuoso’s hand versus those made by an object? Is there any physical approach to a piano key that can produce a sound described as warm, harsh, resonant, tinny, full, shrill or rounded? Let’s start here: Of Piano Tone and Umbrella Tips. This is an archived 1982 article from The New York Times that considers whether pianists can really affect tone through touch. 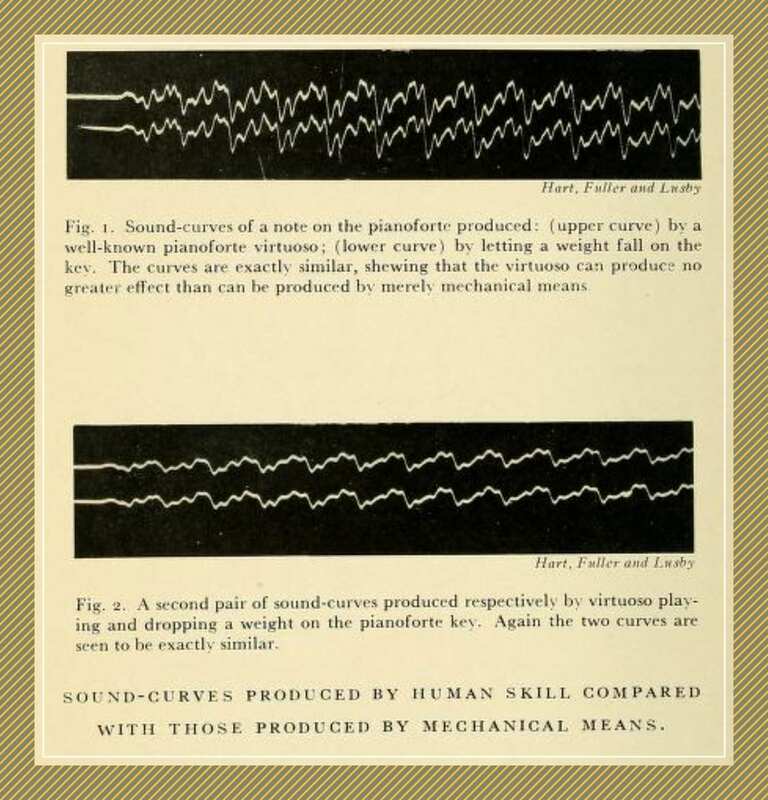 It references a pre-internet flamewar that occurred via letters to the editor of The Musical Times (somewhat interesting in itself), and cites early studies of piano acoustics that tested whether listeners are able to distinguish piano sounds produced by a virtuoso from those produced by mechanical means. I accessed summaries of those early studies (Hart, Fuller & Lusby, 1934) via the magic fairy known as “Interlibrary Loan.” It looks like this may still be under copyright, but I did find a free article to share with you from James Jeans’ Science & Music (1937) including illustrations from the studies of Hart et al. and analysis of music acoustics. Many pianists are firmly convinced that they can put a vast amount of expression into the striking of a single note of the piano; some claim to be able to draw the whole gamut of emotion out of a single key. In reply, the untemperamental scientist points out that, in striking a single note, the pianist has only one variable at his disposal — the force with which he strikes the key; this determines the velocity with which the hammer hits the wires, and once this is settles, all the rest follows automatically. Why is this still confusing, in the 21st century? There’s a lot I was never taught (and the more I learn, the more I’m grateful for that). I didn’t know anyone could be so concerned with “touches of keys” that musicianship itself is judged according to its appearance, until recent experiences. It seems science must keep proving the point, and it is. A recent study (Goebl et al., 2004) tested musicians and non-musicians alike. The research indicates again that it is “finger-key noise,” not quality of tone, that indicates touch. These noise components (i.e. finger–key noise) are audible when the key is struck, and absent when it is pressed down. This study provides a first systematic perceptual evaluation of whether musicians can aurally identify the type of touch that produced an isolated piano tone, independently of hammer velocity. Our results suggest that only some musicians are able to distinguish between a struck and a pressed touch using the touch noises as cue, especially the finger–key noise that characterises a struck attack, whereas others could not tell any difference. Without those touch noises none of them could tell a difference anymore. When they could not hear the touch differences, they tend to rate louder tones as being struck, and soft tones as being pressed. We can only speculate about how the present findings generalise to a real-world concert situation (including pedals, reverberation, reflections, and the listener at a certain distance away from the piano). In the light of the present results, we consider the pure aural effect of touch noises (excluding visual and other cues) a rather small one. Want more studies? Here – I can hook you up. 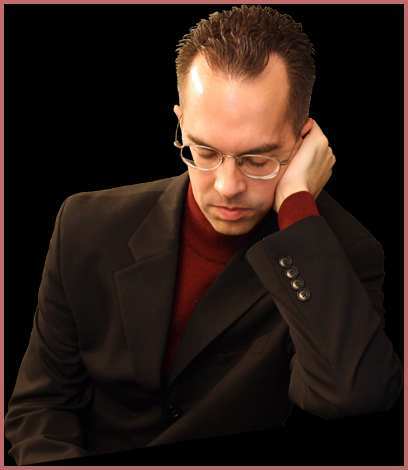 I looked around for other blogger-musician-teachers who can’t bring themselves to accept bogus ideas, and hit the jackpot when I found Chad Twedt’s blog (“Cerebroom: sweeping dust off of truth, one thought at a time”). I suspected we might think alike when I saw his category devoted to debunking and contrarian posts! If you read nothing else, read Chad’s definitive analysis of The Piano Voodoo of Tone Production. This session will present the findings of several new radical studies in neuroscience, making a strong case for the idea that one cannot perform music when there is an absence of brain activity. The studies looked at a cumulative 1,350 comatose hospital patients who failed to make music after being told to play something. Chad’s article “Tone Production: Doing the Right Things for the Right Reasons” was published in Clavier Companion (July/August, 2016). He begins with an anecdote that sounded familiar. As a sophomore in college, I performed in a master class given by a former Van Cliburn Competition medalist. At one point, I was asked to play certain chords so that my fingers moved toward the fallboard as they depressed the keys, and this was supposed to change the timbre of these loud chords without actually changing their volume (providing a “richer” sound). It took all of my willpower to quietly follow this advice and not bring up the fact that the piano escapement mechanism makes the basis for the advice fallacious. I didn’t want to be disrespectful, so I followed the advice. This “pushing in” technique caused the hammers to strike the strings more slowly, as I predicted it would, producing a softer sound, giving the master of the class (and the audience) a most glorious false positive. I felt violated, because I had just been used as a tool to advance an illusory belief system I did not share. Asking me to simply play softer would have been equally as effective and a lot simpler. 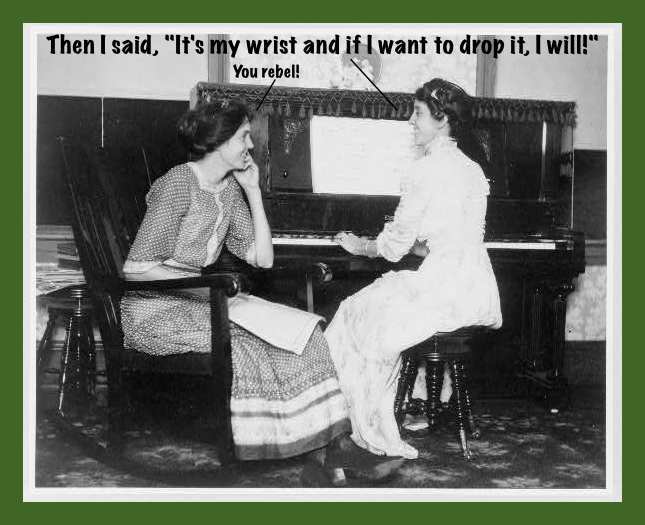 I’ve received instruction like this in more than a few lessons and master classes, and I have encountered many teachers and pianists who subscribe to various beliefs about what can change the tone of a given note at the piano. This has led to my interest in researching the topic. I contacted Chad, and asked him a few questions. CT: The first form I encountered in a lesson was when the instructor insisted that they could hear the difference between the “harsher” staccato and “warmer” legato touches while the pedal is held down. I responded that if there were a difference, it had to be due to the staccato touch tending to produce greater key velocities since vibrating piano strings don’t know what happens to hammers after they rebound away. The instructor insisted there was more to it, and when I asked them to explain what principle of physics is behind the claim, they suggested that the acoustics in the piano are changed by the fact that the hammers are held a few millimeters or centimeter closer to the strings while the keys are held down than when they are released. I chuckled in disbelief and said that such detail could only be audibly perceivable by the android “Data” from Star Trek: Next Generation. In that exchange, teacher and student decided to agree on the technique, but not on the rationale for it. Chad’s respect for his teacher grew from the openminded dialogue. A popular method of educational pseudoscience requires children to drink water and move in specific ways in order to improve brain function. While the movements do no harm and everyone needs water, reading and math skills are not improved by physical exercises and we can not really water our brains. To teach children that these activities assist learning by some magic physiology is to teach untruths, even though movement and water are good for us in ways science explains. Not everyone cares about acoustical details as much as I do, which is why many would have just followed this advice without any trouble at all. But I know I’m not the only person who experiences psychological paralysis when asked to do something that goes against inner understanding. It wouldn’t feel much different to me to be asked to pray to Xenu, dictator of the “Galactic Confederacy” who, 75 million years ago, brought billions of his people to Earth (according to L. Ron Hubbard, founder of Scientology). I just can’t do it. It’s important for teachers to be prepared to engage with similar students on this level. Illusions are not satisfactory for all students. MD: What were you taught about technique and tone production as a child? MD: How did you learn about the mechanism of the piano? CT: … Most of what I learned about the piano mechanism, I learned as a kid by looking inside of the grand piano while my father played, or by talking to piano technicians. Also, as a math person, I naturally took an interest in all the many mathematical principles that govern sound and music, which of course we could think of as another “mechanism” behind all music. MD: Do you hear more from people who agree with you about piano voodoo, or more who disagree with you? This doesn’t mean technique and movement at the piano don’t matter. Again, technique is important. Movement is essential. The point is having clarity about why we do what we do, especially when we are teaching others. Goebl, Werner; Bresin, Roberto; Galembo, Alexander. 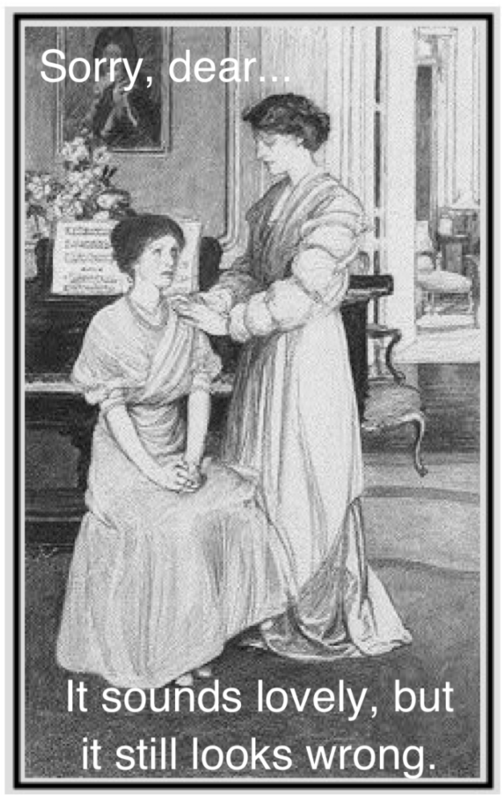 “Once again: The perception of piano touch and tone. Can touch audibly change piano sound independently of intensity?” Nara, Japan: Proceedings of the International Symposium on Musical Acoustics, 2004. Jaques-Dalcroze, Emile. Rhythm, Music & Education, 123-124. Reprint, Salem, New Hampshire: Ayer Co. Publishers, 1985. Jeans, James. Science & Music. NY: MacMillan Co., 1937. Twedt, Chad. “Tone Production: Doing the Right Things for the Wrong Reasons.” Clavier Companion, July/August, 2016, 20-25.